This is not just a beautiful family home set in wooded grounds on the banks of the Gers river, but it is also a successful gite and bed & breakfast business and is sold as a going concern. The owners had projects to convert the large barn on the estate into an events venue to fill the demand for quality wedding, corporate and family reunion venues in the Auch region. What sets this estate apart from others in the region is the château’s connection with the Italian artist Mario Cavaglieri who spent most of his life (and the twentieth century) in the house. His works are everywhere: extravagant ceiling frescos, murals, painted furniture as well as canvases at every turn: his work is – literally – indissociable from the château and is, therefore, being sold with it. – the château: used as a family home with large reception rooms (dining hall, lounge), fitted kitchens, balcony and terraces, 3 bedrooms and bathrooms. Labyrinth of cellars and workshops under the main house. The private 12 metre pool is adjacent. Central heating. – the West wing: this is where we find the two guest suites. One is devoted to Cavaglieri and has particularly fine murals by the artist. The other is on the ground floor with access by French windows to a private garden. – the gîtes. 4 of these are in the east wing and one in the west wing; most are on two storeys with sumptuous living, dining and kitchen space on the ground floor and two or three rooms on the upper floor. All gite residents have access to the guest pool and spa. – the spa. In its own converted stables the spa boasts a jacuzzi, power shower and sauna. – the cabin. This simple cottage is used to house young people who spend the summer on the estate helping with gardening and maintenance work. 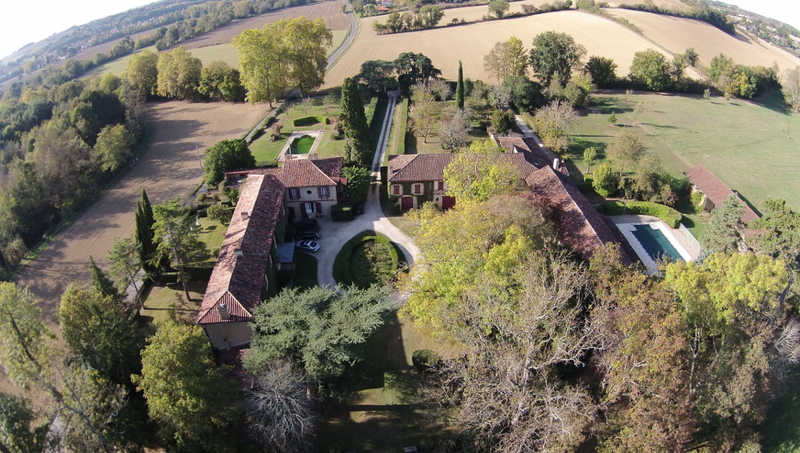 The 13 hectares of land surround the château meaning that there is no neighbour nearer than 500 metres. The land includes arable (leased to local farmers), woodland, an island in the Gers river, as well as the immediate grounds around the buildings: maintained in the French style.